In this hybrid mentoring program, undergraduate students from underrepresented populations in STEM (i.e. racial and ethnic minorities and/or female students) are given an opportunity to connect directly with trained graduate students and peer mentors in a non-formal, social environment. The program is designed to provide additional psycho-social (social, cognitive, and cultural support) for STEM identity and talent development. 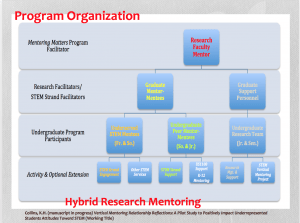 Utilizing a vertical mentoring approach, graduate and peer mentors facilitate one of the Mentoring Matters strands while also being mentored by a STEM professional and/or research faculty in scholarship, research, and practice. The Mentoring Matters program itself is a 10-week program during the spring semester where select undergraduate students meet every other week (2 hrs per week). A required orientation jump starts the program for registered students . Please contact Dr. Kristina Henry Collins, if you are interested to learn more or plan a special session for a cohort of STEM Students. As well as students will also participate in the STEM Learning Communities which offer a unique mentoring experience focusing on your future career, resume building skills, as well as focusing on your STEM identity. Unique Support system of Undergraduate Peer Mentors, Graduate Level (Masters & PhD) Mentors, and a Faculty Mentor. STEM Mentoring Matters | Powered by Mantra & WordPress. Comments on the contents of this site should be directed to Kristina Collins.